That is one frightening spider bite reaction! Eeek! Since we’re talking about neurotic dogs (weren’t we?) mine freaks out when I start packing, as in today I was packing the boys clothes in a bag to spend the week with grandma. He knows exactly what that means! Road Trip! This time around it’s only a 15 minute trip. Hope the blog gets to feeling better soon..looks fine to me, though I guess “herpes” was something you didn’t really tell your partner until it’s too late. I seemed to come out fine…wait this is sounding way worse than I meant for it. Maybe I should send the blog a get well card? Holy Pete, that looks nasty! You got me with that title- I jumped to your blog first. Poor bro- that looks SORE! Blessings to all- the sick blog site, bug site and mad dog alike. Are you sure that isn’t a brown recluse (fiddller spider) bite? My hubby has been bitten by those twice and they can be quite nasty and cause necrosis of the area surrounding the bite. 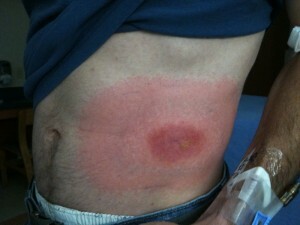 He had to have antivenom shots in his belly button the first time! I could have SWORN I commented on this post. Senior moment? I wonder … Anyway – as i think I said before, that’s one nasty looking bite. i hope that IS a black widow bite and not a brown recluse. Brown recluse bites are even nastier than black widow bites. Holy ouch! I got bit last year by a brown recluse. Nasty!